We have published Abdominal Aortic Aneurysm (AAA) screening data for England for the screening year 1 April 2017 to 31 March 2018. The data is in a new format this year and we are publishing our screening standards in full. We have included a set of presentation slides about the data for the year as well as slides that describe trends in the data going back to the 2013 to 2014 screening year. The NHS AAA Screening Programme aims to reduce the number of premature aneurysm-related deaths through early detection, appropriate monitoring (surveillance) and treatment. 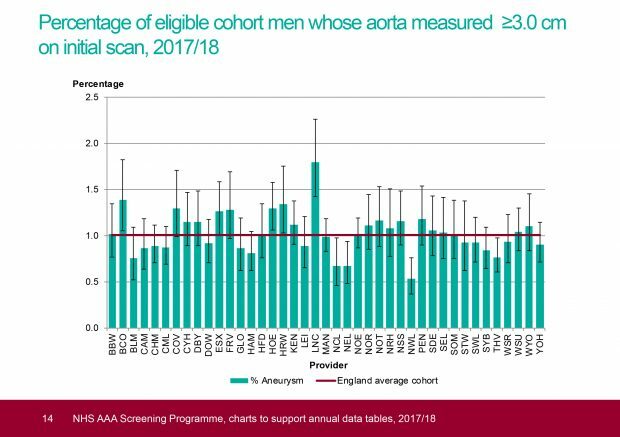 A total of 285,693 men in England were eligible for their initial AAA screening appointment between 1 April 2017 and 31 March 2018. Of these, 80.5% were screened by 30 June 2018 and 1.0% had an aneurysm detected. In addition, 10,997 men aged over 65 self-referred into the programme and 97.1% of these were screened by 30 June. The aneurysm detection rate in self-referred men was higher, at 3.6%. There were 14,448 men with small or medium aneurysms on surveillance at the start of the year. During the year, 12,008 annual surveillance and 8,376 quarterly (3-monthly) surveillance appointments were due. 91.3% of annual surveillance appointments due resulted in a conclusive test within 6 weeks of the due date and 91.9% of quarterly surveillance appointments due resulted in a conclusive test result within 4 weeks of the due date. In total, 809 men were referred for surgery, including 587 from surveillance. Just over half (52.4%) of men who were appropriately referred, did not decline and were suitable for surgery were operated on within the 8-week target. Nearly 9 out of 10 (89.1%) of appropriately referred men who did not decline and were suitable for surgery were operated on in total. Aneurysm repair surgery is a serious operation and sadly 1.13% of men operated on died following surgery (the post-operative 30-day mortality rate). The national programme team will be reviewing the AAA screening standards in 2019. We will be consulting on the standards and any potential changes later this year. We aim to publish the new standards in December 2019 with an April 2020 implementation date.